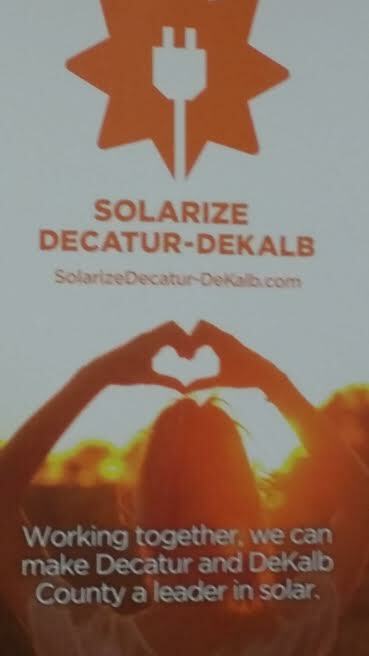 (APN) DECATUR — DeKalb County homeowners, business owners, and environmentalists showed up at the downtown Decatur Recreation Center for a town hall meeting on September 01, 2016 to learn how to solarize their homes and businesses with the Solarize Decatur-DeKalb campaign. One can sign up online for a free solar evaluation between September 01 and December 31, 2016, or call 678-801-8965. More workshops and events will be held throughout the four month campaign to educate the public about the benefits of solar. Solarize Decatur-DeKalb County is a community-based solar bulk-purchasing campaign to make solar more affordable and accessible for citizens. The more people who participate in the program, the lower the price will be. However, once the campaign ends, so does the discount pricing. “We are already starting at about a fifteen percent discount from what you would get if you just called a few solar installers….so you are already saving money with this program,” Don Moreland, President, Solar CrowdSource, said at the meeting. The organizers of the campaign sought competitive bids from local solar companies to get the best materials by qualified solar professionals for the lowest price. Creative Solar USA, headquartered in Kennesaw, will provide all the residential installations for Solarize Decatur-DeKalb. Hannah Solar will install the commercial and municipal solar projects. The program is made possible, in part, by the Solar Power Free Market Financing Act of 2015 passed by the Georgia General Assembly. This law has allowed Georgia residents to enter into financing arrangements for the installations of rooftop solar panels, instead of having to pay all the money up front. “Solar is taking off and the cost is coming down… we have 66 solar installations in DeKalb County, and we plan to double or triple that with the launch of the solarize program,” Jennette Gayer, Director of Environment Georgia said at the meeting. The cost to install solar has fallen by 73 percent since 2006, according to the Solar Energy Industries Association. The average solar customer can save 35 to 40 dollars off their electricity bill each month . There is a thirty percent tax credit when one purchases solar that be can extended over several years. Solar will also increase the value of one’s home and property. A solar installer will evaluation your roof and let you know if it is suitable for solar. A roof should be in good condition and structurally strong enough to accommodate the additional weight of the solar panels. If one’s roof is old, shaded by trees, or otherwise not suitable, there are also ground mounted systems. Any solar energy you generated and not used, will be sold back to Georgia Power for about four cents per kilowatt (KW) and will be credited on your bill. The panels have a 25 year warranty and require very little maintenance. Panels should be cleaned every every years. One can finance a solar project with little or no money down through Suntrust, Greensky, and Bond Federal Credit Union as trusted financing sources for the Solarize Decatur-DeKalb campaign. The meeting was organized by Decatur Sustainability Board, Environment Georgia, Georgia Interfaith Power and Light, the Georgia Chapter of the Sierra Club, and Solar Crowd Source. The Solarize Georgia program has already been successful in Athens, Georgia, with over 700 people signed up for an evaluation of their home or businesses. Solarize Tybee program added an additional 60 homes to receive discounted solar panels. Solarize is a national program supported by the U.S. Department of Energy that helps local governments promote solar energy to homeowners and business owners by streamlining the selection of an installer and buying in bulk to reduce cost. The program started in Portland, Oregon, and has been implemented in more than 200 communities around the U.S. This sounds awesome! Thanks for telling us about it Gloria!